The Ejyafjallajokull Volcano in Iceland continues it’s eruption with an increase in earthquakes and ash, once again causing air travel disruption. The Earth has just been hit by a solar storm, there is a new Sunspot capable of producing massive CME’s, and there is an Eta Aquarids meteor shower today at 4:49 GMT. …increased earthquake activity beneath Eyjafjallajökull has been recorded. Precise locations of the earthquakes show that their source is at first very deep, at about 23 km depth, but then migrates upwards. This strongly indicates that “new” magma is intruding into the magma conduit and pushing on the over-lying magma, causing a difference in pressure at the surface. It is therefore anticipated that the eruption will continue at FULL FORCE in the next days. Significant changes in horizontal movement at GPS stations around Eyjafjallajökull have been observed in the last 48 hours. 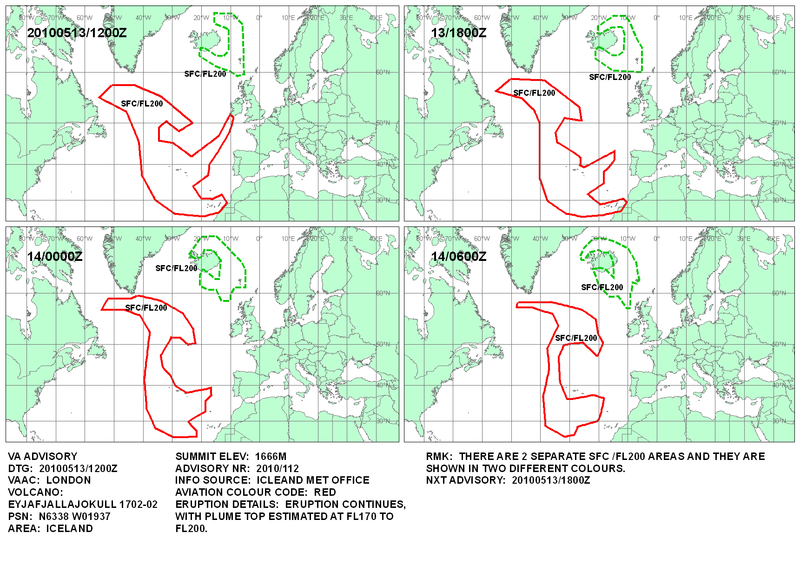 Sourced from Iceland Met Office Update on May 5, 2010. 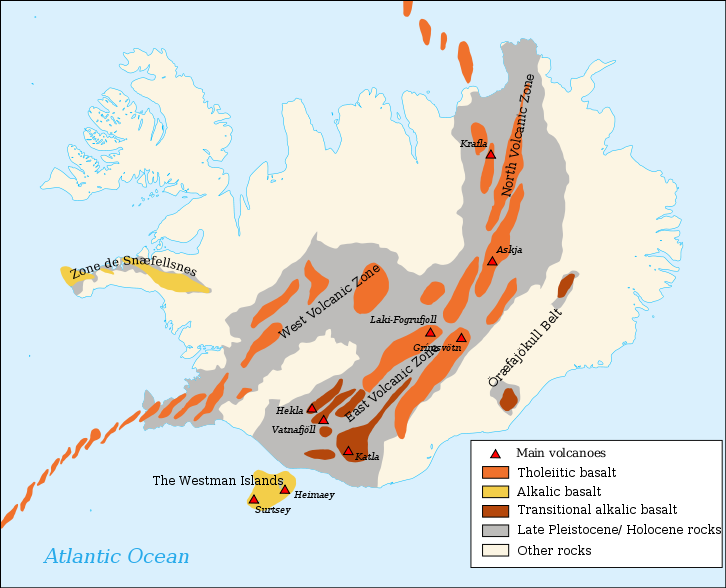 Iceland’s Volcanic activity today is relatively calm compared to other corner’s of the world. Yet, the world turns. The Iceland Review is reporting a “A bluish mist or gas has been seen rising into the air at Gígjökull, an Ejyafjallajokull glacial tongue, where the lava from the volcano is flowing. The mist is believed to be connected with the lava flow. strong>UNKNOWN GAS CONNECTED TO LAVA FLOW? Vulcanologist have been study long enough to know what to expect. We’ve all heard the predictions that no one can predict anything, but who would predict that with in about an half and a half , the white gas like substance has dissipated in these time stamped photos from Google. How long has it taken for the ash to dissipate the airspace in Europe? Oh, that’s right, IT HAS NOT. There has been something…lava or water, flowing out of the keyhole portion of the glacier since the original eruption. We have seen nothing anywhere near this amount of haze until now. The "cloud" is mostly gone by 12:49:36 GMT, and the Sun is Shining! No matter that it is a restricted area, at 15:39:58 this guy stopped to do whatever. It must not bee too cold up there, the guys wearing shorts standing in the middle of a glacial flow of liquid. Nothing to see here, move along. Time for dinner, 15:39:58 GMT. GRAB YOUR TINFOIL HAT! During the first of the major eruptions most of Europe was grounded by ash and particles in the sky. Whatever this gas is- or was, stayed close to the ground eventually blocking out the entire volcanic area. Aren’t silica particle supposed to go up, damaging plane engines? Yet this gas is eerily on the ground like a fog machine on Halloween. Is there something to hide in all that gas under the auspice of another eruption? HAARP? Could a government be running HAARP like tests, zapping the volcano with it’s ionospheric heat beam that, if you don’t know exists by now, you can find the HAARP home page all by yourself. Perhaps EISCAT or any of the other arrays in the area? A LASER BEAM, not Lightning? Ah, the beauty of a lightning storm over a volcano. Looks pretty cool, until one realizes that a laser could be used to discharge lightning to attempt to deprive a cloud of energy. It is usually associated in the case of hurricanes, but perhaps in this case- a volcano. A liquid nitrogen cloud? Perhaps someone came up with the idea of pouring liquid nitrogen into the volcano to try to calm it down by freezing the crater to death. http://en.wikipedia.org/wiki/Liquid_nitrogen Liquid nitrogen is odourless, colourless and tasteless. No one would be the wiser if it were used to try to cool magma. The after effects of SOLAR STORM? A high-speed solar wind stream hit Earth’s magnetic field last night (May 2-3), sparking a geomagnetic storm that lasted more than 15 hours. In Scandinavia, the Northern Lights were so bright they could be seen through the glow of the midnight sun. Red auroras spilled across the Canadian border and were spotted in several US states. FAST-GROWING SUNSPOT: New sunspot 1069 didn’t exist yesterday. Today it is growing rapidly (movie) with several dark, planet-sized cores and a complex magnetic field that harbors energy for C- and M-class solar flares. Readers with solar telescopes are encouraged to monitor developments. http://spaceweather.com. ALIENS ‘n UFO’s? What’s an article on conspiracy without the aliens and ufo’s? Could this unidentified gas be some sort of spent fuel from a UFO? Perhaps the aliens just needed a walk to study the volcano? Could a fleet of UFO’s have laid a gas cover to escape or get into an underground location? As for now, unknown gases will apparently remain exactly that- unknown. What we do know is that: The 2010 Eta Aquarid meteor shower will peak on the morning of May 6, 2010. Stargazers should however see nearly as many meteors on the mornings of May 5 and May 7. The full range of the Eta Aquarid meteor shower is from about April 21 to May 12. Stargazers who have cloudy nights during the peak might therefore be able to observe a few Eta Aquarid meteors a few nights after the peak. Lastly — sorry about the text size issues- WPress html not cooperating. cest la vie, bigger things to worry about.